As of September 2017, there are 24 local food councils in the state, not including several that have been active in the past decade but have since dissolved in order to transition to new forms of community engagement. In the fall of 2016, the OFPN received funding from the Stinner Endowment to conduct an assessment of Ohio’s local councils and their needs. Read the report here. To learn more about a council’s areas of expertise, networking interests, and contact information, simply click on the county on the chart. If you have updates to any of the information listed, please contact Amanda Osborne at osborne.414@osu.edu. Updates will be made once a month on the last business day of the month, though time-sensitive updates can be made as well. What is a local food council? Food councils are diverse, cross-sector groups of food-system stakeholders who collaborate to transform their local food systems. Work can range from drawing synergistic connections among members’ existing work, to identifying and filling gaps in local food system infrastructure, to campaigning for public-policy change. As communities work to change their food systems, they encounter legal and regulatory barriers. Food councils strategize to cultivate a policy landscape that cultivates sustainable, equitable local food systems. Who is on a local food council? Ohio’s councils are composed of diverse and dynamic coalitions of individuals, organizations and institutional representatives. Each council has a unique story regarding membership; there are many forms of involvement and “membership,” and each council has different levels of formalization of those categories. The above diagram developed at Michigan State University demonstrates the complex and multifaceted nature of the food system. 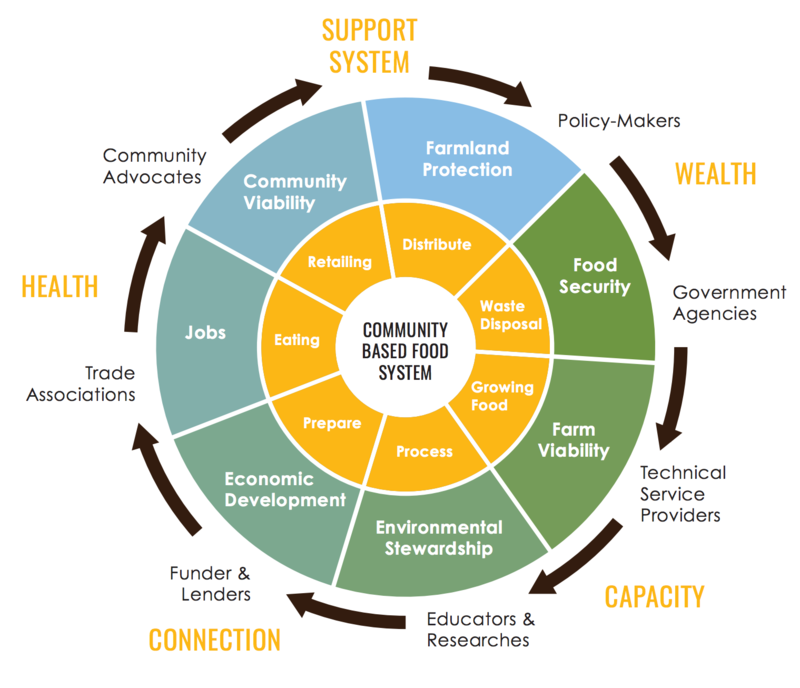 Food councils, as coalitions of diverse food-system stakeholders, seek representation from all parts of this diagram as they build toward comprehensiveness. On the ground, all of us participate in our food systems in multiple, often overlapping roles. This graphic was adopted from the CS Mott Group at Michigan State University. How many food councils have paid staff? Paid council staff is a rare form of capacity, currently only found in two Ohio councils. The Greater Cincinnati Regional FPC as an initiative of the non-profit organization Green Umbrella, has been funded since its initiation, and has a permanent Director position. The Summit Food Coalition got started without any funding and went through the process of seeking support from its local Community Foundation. After building a relationship with the foundation, the Coalition was able to hire one of its founders to work part-time as director. She will be transitioning to full-time in 2018. The most common form of supported labor for food councils arises from a council organizer’s position working for an organization other than the council, often when they find their job goals align with the goals of the council. This allows them to spend time when they are at work to maintain and develop the council. Council labor provided in this way varies in formality, flexibility, and actual capacity.